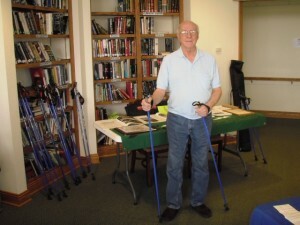 Home » Hiking Seniors » How to Properly Measure Walking Poles? Walking poles or also commonly called “trekking poles” have become widely used by any outdoor enthusiasts, such as hikers, backpackers, or even just ordinary people who love to walk. 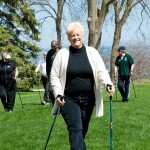 Walking poles are very beneficial, especially to seniors who will go on a hiking activity, since walking with walking poles have numerous health benefits that can be gained by seniors who are going to use them. Walking poles can really be beneficial to seniors since it can help in relieving stress and too much weight bearing of the waist and lower extremities. However, if seniors do not know how to properly choose the right walking pole and how to properly measure the right length of the walking pole, seniors may not gain all the walking pole’s benefits, and in fact, it may even possibly cause negative effects to seniors. As mentioned above, it is very important to use the right walking pole according to the seniors’ needs for them to be able to gain its full advantages. One factor in choosing the right walking pole for the user is the proper length measurement of the walking pole according to the user’s torso and arm length. Being able to find the right measurement for your walking pole, may it be a telescoping (adjustable) walking pole or a one-length walking pole, the user will find using the walking pole comfortable and effective means of support. If possible, position yourself standing up on a concrete flat and level surface. If finding a concrete flat surface is not possible, try to position yourself somewhere flat and sturdy. Flat and sturdy surface can really help in accurately measuring the perfect length for your walking pole. 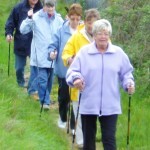 Extend or lengthen the walking pole up to the maximum extension limit. 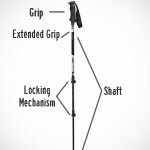 Not all adjustable walking poles can be adjusted the same way. Please refer to the printed instructions that came with your walking pole on how to properly adjust (lock and unlock) your walking poles’ length. Once the maximum extension limit is reached, lock the lower section of the walking pole in place. Place the bottom tip on the floor and the handle bar near your armpit. Slowly slide down the length of the pole until it reaches approximately 2 inches to 3 inches below your armpit. Once the handle of the walking pole is already 2 inches to 3 inches below your armpit that will be the length appropriate for your use. Lock any locks of your walking pole once measurement is done. 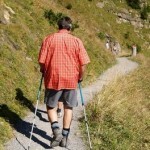 For the other walking pole, adjust it just according to the length of the 1st walking pole you have just adjusted. 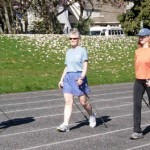 Once both walking poles are already have the same length, try walking with the walking poles. If you feel that it is too short or too long, you can make some adjustments to each walking pole’s length.